As is often said nothing goes down better than a cold bottle of blackmail to beat the heat. And seems like our babe here is caught up on the wrong side of the bottle. In a phone call, Lola (Franka Potente) learns that her boyfriend Manni (Moritz Bleibtreu) will be killed by a drug dealer unless she and Manni cough up $100,000 in the next 20 minutes. This sends her on a frantic dash for cash to the accompaniment of mod music and results in scenes of a lot of running. Remember the film 'Groundhog Day' where Bill Murray played Phil, the sarcastic weatherman who got to redo the day several times until he finally performed it the magical way it was fated to happen? Same deal here, only instead of Phil the sarcastic weatherman we get the MTV treatment. We cheer for Lola, the cute hyperkinetic screaming bimbo with army boots, tattoos and color-dyed hair, as she high tails it to Daddy's bank. Lola's got 20 minutes to succeed, the stakes are deadly, and she doesn't get as many chances as Phil did. It makes for a fun and quirky collage as small details happen right and left, which keep changing the fate like shards in a kaleidoscope. But apart from the fast pace and the unrelenting goof-ups of the lead pair, with a lot of Bollywood-type masala, this movie actually doesn't let you get bored. But what amounts to its unmaking is some rather stiff acting by the leads and some rather steamy, but very unwanted, scenes dumped on the story. But going by their normal standards, this flick is a masterpiece, at least as long as only scripting is considered. 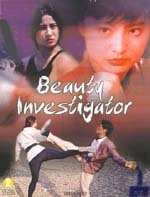 Be the first to comment on Beauty Investigator! Just use the simple form below. fullhyd.com has 700,000+ monthly visits. Tell Hyderabad what you feel about Beauty Investigator!